Normally, when allowing bottled beer to naturally carbonate, you need to let them sit for 3 weeks to reach full carbonation and to allow the yeast to settle (otherwise, the beer can have a nasty yeast ‘bite’ to it). But, despite bottling less than 2 weeks ago, I couldn’t wait any longer and had to imbibe in a bottle of my Parallax Pale Ale. Despite being bottle-conditioned, the beer was quite clear, almost totally lacking in chill-haze. 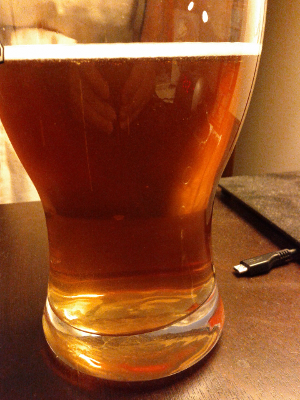 When poured, it was reasonably carbonated (although it should carb some more over the next 1.5 weeks), the yeast stayed mostly settled in the bottle, and the beer formed a nice head. However, the head readily dissipated (pic to the right). 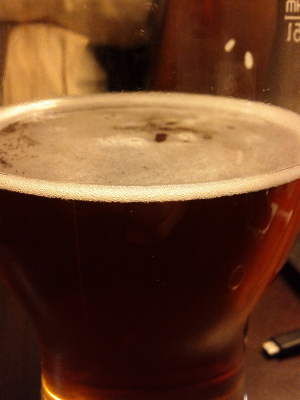 While the head retention was not as good as expected, this may simply be an issue of it not being fully aged, being under-carbonated, or due to a less-than-clean glass. The beer itself was unexpectedly dark – the recipe predicts a colour of 9 SRM (slightly darker than your average bud/coors/molson), and instead I ended up with ~17 SRM. That doesn’t bother me any, although I’m unclear as to why it happened. Of course, none of the above really matters – how it tastes is all that truly matters. The smell of the cascade hops came through clearly, and as expected with a 50 IBU beer, there was a strong, but not overpowering, hop-bitterness to the beer. Often, at such a young ‘age’ this kind of bitterness can be harsh, but much to my delight, it was already smooth and pleasant. As expected, the beer was low-body with only modest maltyness, and a touch of sweetness, making it ideal for today’s 40C temperatures. Strongly hopped beers typically age well; becoming smoother and mellower with age. Given how good this green beer tastes, I expect great things from it.